Being married to a photographer who shoots weddings (among other things), I have to tell you that Andrea is really covering so many bases on her site! It is such a wonderful resource for brides to have a "what happens after the wedding" guide to let them know the photography process once the big day is over (what to expect with touch-ups, viewing images, printing, all that little stuff that gets lost in the big day shuffle.) She offers a similar guide for regular photoshoots, as well. This photographer cares about her clients throughout the whole process, and that's a huge deal! So click on over and check out some of her work! (Kinda makes me want another baby just so I can do a newborn photo session!) 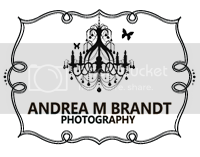 All images courtesy and copyright of Andrea M Brandt Photography. I'm your newest follower. I'm looking forward to trying some of the tips, tutorials, etc.